Once after watching an old Saturday Nite Live skit (or maybe it was after watching Baby Mama, I forget), I likened myself to Tina Fey. Husband raised his brow and agreed with this and remarked, "Except she's funny." Touche. 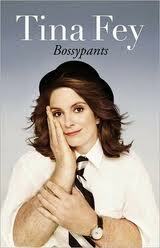 I had the pleasure of reading Bossypants during our get-away to Minneapolis in the past few days. And if my hubby were to read the parts that I didn't read aloud to him, he just might find more similarities than he might think. Busy. Working Mom. Guilt. Bossy. Pants. Not terribly mean. A peppering of feminine outrage. (Not the set your bra on fire type, but have experienced enough in the workplace type...)And if I were half as clever as Ms. Fey, we'd be like two peas in a pod. Oh, the girl is funny. my Gen X mentality, and whoosh, when did we get slammed into this adult world? I completely related to her highly scientific stress graph on various workers such as comedy writers, coal miners and TGIF managers. Next time I feel a bit of adrenaline on a hectic day, I'll remember her graph. Admittedly, she threw a few names and references in the book that left me clueless. (NO! I'm not talking about Palin, McCain or Lorne Michaels! Do you know who Lorne Michaels is? Huh?) They were probably names well known to people with a vast knowledge about the world. Unlike me. No - I'm not calling her a namedropper! Gheesh. Tina seems about as down to earth as, well, let's just say she doesn't even drive. (Wish I could get away with that.) And there are many other interesting things you'll find out about her if you read the book. Bossypants is much more than a humorist's rant. It's an interesting tale of a woman who worked hard in a tough industry. Yes, especially for a woman, it was tough! But the book impacted me so that as a matter of fact, I'm urging my daughter to consider a career path as an SNL writer. (What kind of mother does that?) Now, Alex is reading Bossypants. (What kind of mother allows that?) Apparently, I do. The other night I had a dream (the night I fell asleep reading the book - although it was very good reading), that Jimmy Fallon missed a marketing meeting. Kenan Thompson, though, had astutely made it. As it occurred to me that we had great comedians working for our bank, I leaned over to Kenan and asked, "Do you guys really need the day jobs?" He nodded and replied, "Oh, yes. SNL isn't as lucrative as you'd think." That's all I remember about the dream. And I don't really want to think about what it means as I'm trying to get a novel written. Anyway, the book is awesome - hilarious - compelling! I hope Tina reads my review and wants to become my new BFF. But that might be weird. Thx for the review! Can't wait to read it!! !